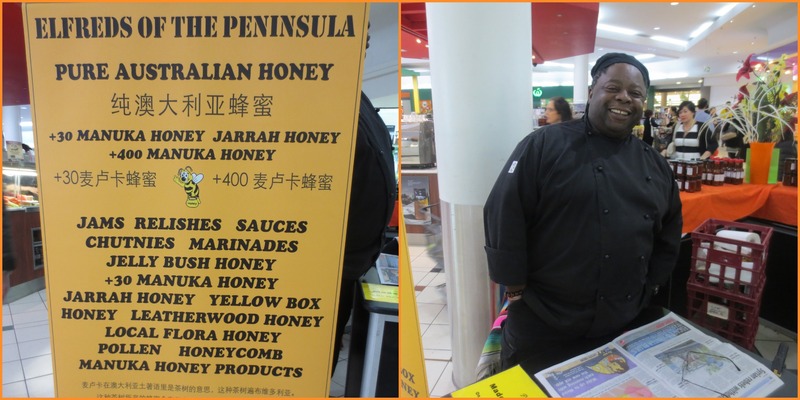 Walking through Box Hill Central Shopping Centre, I came upon this little island of honey and relish delights. The man behind the counter sparked my interest enough to stop and chat a while and to find out what he was all about. His products were an interesting variety and dressed in his chefs outfit, I just had to play 100 questions in fifteen minutes. Kasundi, Chilli Relish, Chilli Jam, Pepper sauce, Chilli mustard, really hot relish, lime pickle, harissa, etc. Fred has been a chef since he was 18 and he comes from the UK. He's been in Australia for the past 25 to 30 years (to use his words) and used to be a pastry chef. He's worked in the Delganeys Portsea area and also worked at the Admiral Crichton, UK. He was one of the original Barmy Army who came over with the cricket, and never left. After many years of being a chef, he decided on a more relaxed lifestyle change, cooking to the beat of his own drum. Jerk Chicken, Mumbai Chutney, Tomato Relish, Apple Chutney, Onion and Red Wine Marmalade, Piccalilli and so on. Having been a world traveller, he brings the taste of the world to you in his huge variety of beautiful flavours of chutneys, sauces, jams and relishes with some old time favourites. He gets his honey straight from the apiarist and he tells me he has an eclectic range of products to offer his customers. You can find Elfreds of the Peninsula at various markets and shopping centres. Check his website, his Facebook page and the Craft Markets Website to check where he's going to be next. Go ahead and taste test his honey, jams, chutney, relish and sauces. You know you want to. He has enough variety to make one curiouser and curiouser.